My passion for secondhand clothing is a long-standing one. The obsession might’ve started off as a purely money-saving venture (as a teenager, I would set off, pocket money in hand, and hit the local charity shops, safe in the knowledge that I could bag twice as many pieces as I could in Topshop), but over time, it blossomed into a full-blown love affair. Fast-forward to 2019, and my tastes might be a little more refined and my bank balance a little less student-like, but my crush on all things vintage is still going strong. There’s nothing more soul-restoring that having a break from high-street fashion (I still love you, don’t worry) and diving headfirst into an eclectic rail of weird and wonderful pieces that hark back to a bygone era. I can leave with a one-of-a-kind item of clothing, knowing that I’ve helped “close the loop,” even if in a small way. From various conversations over the years, it’s become clear that many people find the idea of secondhand shopping slightly intimidating. Either you’re a vintage shopper or you’re not—there doesn’t seem to be much middle ground. But if you can find the time, I’d really recommend giving it a go, as it’s honestly one of the easiest (and funnest) ways to make your shopping habits more sustainable. And if nothing else, it’ll save you a fair amount of money. If you’re still feeling a little uncertain, let me give you a helping hand. 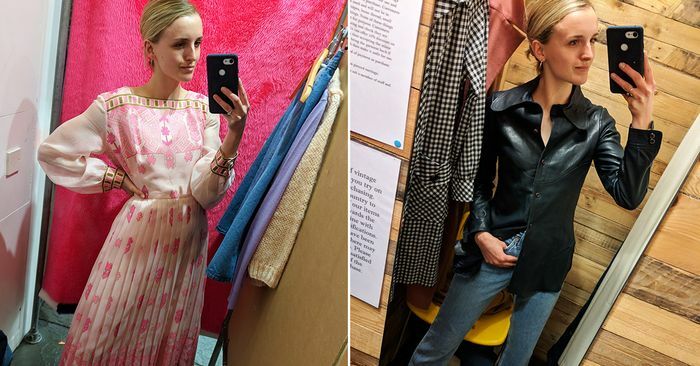 I’ve picked 10 key trends for spring/summer 2019 and headed to a few of Covent Garden’s finest vintage stores to show that you can, in fact, get new-season styles secondhand. I’ve also included similar styles below, which I’ve handpicked from Rokit and Oxfam’s online stores (perfect if you don’t fancy braving the shops). Scroll down to see what I found.